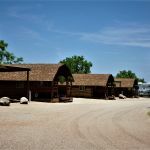 Ask fellow campers about "San Angelo KOA" and nearby attractions. We were scheduled for a 2 night stay, high winds left us here for a 3rd day. Checked with the office on the morning of our 2nd day and the spot was open for one extra night, for same nightly rate. Office staff was helpful and friendly. Laundry well priced 1.25 wash 1.00 for large capacity dryers. Sites are pea stone, level, a lot of rain our 2nd night but not mud or puddles the next morning. Would stay here again, easy to find and fairly close to shopping, stores and town. We had a pull thru regular site with opposing side by sides. Wifi was excellent one day, a little slow the second, but better then most places. 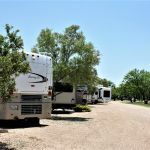 We camped at San Angelo KOA in a Fifth Wheel. The park is located near one of the lakes in the area. They have pull thrus and backins. The site we had has a patio with chairs and fence between sites. Some sites don't have those amenities. The sites are all gravel some have nice spacing others look to be side by side. The staff is VERY helpful and friendly. We had an electrical issue when we arrived at our site and they were there very quickly to test the circuits and find the problem, they did and changed a breaker before I could finish setting up. All of the staff we talk to anted to be sure our stay was good and wanted to do anything to make it a great stay. Most defiantly we will be back when in the area. We camped at San Angelo KOA in a Fifth Wheel. 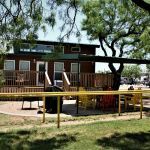 Nicely maintained KOA within a few miles of historic San Angelo Riverwalk. Sites were level gravel with good electric and water. Propane was available and fairly priced. Situated near a park, a lake and an airport. Planes approach overhead during day, so be aware, we were exploring the area so it was not an issue. Helpful staff, park set amongst old mesquite trees. We camped at San Angelo KOA in a Fifth Wheel. What a nice town.Riverwalk gorgeous on a sunny day. Miss Hatties Bordello Museum and nearby Hattie Restaurant were fun and interesting. Pack Saddle BBQ was excellent and always busy. So was Rosa`s Cafe and Tortilla...very good. Brix Winery was ok. Rides week in San Angelo...so super active and busy! Good value in a lovely town; we enjoyed two nights here. Gravel interior roads and sites which were "buddy" so we shared our common areas with the neighbor on door side and were very close on the hookup side Friendly folks offered good check-in experience and escorted us to our pull-through, just long enough WSE site with all functional services including cable tv. Iffy WiFi, good Verizon. Pool was closed. We enjoyed our two nights here as we explored the pretty river walk, nice downtown, and the lovely water lily garden. Would stay here again if in the area. We camped at San Angelo KOA in a Fifth Wheel. We really liked this park. In some ways, it was a typical KOA, roads and sites were level gravel but pretty close together. There were some "premium" sites with much more space, patios, and fences between sites. The tent sites were very nice with raised spots and plenty of parking. The recycling center was great! I was absolutely thrilled to find an affordable KOA. We travel a lot and often avoid KOAs because of the expense. All utilities, including cable and wifi worked well and we were escorted to our site. Staff was very helpful, giving city maps and offering suggestions. 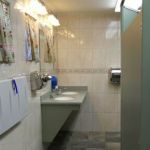 The restrooms and showers were ceramic tile and very clean. There was even a huge handicapped shower stall. The laundry was small, with only 6 washers and dryers but very economical at $1.25 per washer and $1.00 per dryer. We would definitely stay here again. 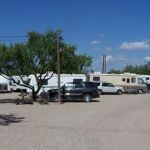 We camped at San Angelo KOA in a Fifth Wheel. 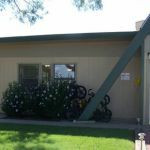 Many things to do in San Angelo and the city is very easy to get around in. The Concho Palace is a great place to go for real country music. We stayed one night at this park and it was excellent for that purpose. Our premium site was at the back of the park and it was a pleasant spot facing a the side fence and looking out into a green space. Much of the rest of the park, however, appeared to be a jumble of small sites, most of which were pure gravel with no tables, landscaping, etc. Most of these looked as if they were occupied by seasonal and/or long term occupants. We had to drive by lots of these sites as we were lead back to ours. Check-in was very efficient; we were handed a package of information without the desk person feeling obligated to explain all of it to us. I'm not sure why this park thinks it rates a KOA "Holiday" designation, rather than being classed as a KOA Journey park. An important tip about getting to the park if you are following the park's driving instructions which tell arriving customers to use Loop 306 to get to Knickerbocker Rd. Unfortunately, on the north side of San Angelo, the highway signs don't identify the road as Loop 306--the only signage calls it US 64. The Loop 306 designation shows up along the way but not when you're on US87 headed south. We camped at San Angelo KOA in a Motorhome. We stayed one night. Our site was level with a concrete patio pad and patio furniture. The site itself was gravel. Our site was at the back of the park and had adequate space between site. Water and electric were at the back. Two places to connect the sewer hose. However, sites near the office looked close together. We were escorted to our site. The park was quiet and was conviently located. We would stay again. We camped at San Angelo KOA in a Fifth Wheel. Great location. The park was pretty busy with 'in and out' stays but it was always quiet and lots of people seemed to enjoy the pool area. The park is very clean and the restroom and showers were immaculate! The WiFi and Cable TV worked very well. You couldn't make a better choice if you are passing through with your RV. We camped at San Angelo KOA in a Travel Trailer. I can't say I like San Angelo so much but the whole city did seem clean and there was plenty of restaurants. Reasonably level, partially shaded site with excellent hookups, concrete patio with wire bistro table, two chairs and loveseat under a small outdoor light, separated from other sites by a privacy fence. Good cable, best WiFi connection on this trip. As our site was one of the most distant from the recreational facilities, we did not walk over in 106 degree heat, so cannot address them. Would happily stay here again. We camped at San Angelo KOA in a Motorhome. We got a deluxe site which overlooked a nature trail with lovely wild flowers. Unfortunately the first site we were assigned was very unlevel front to back; front wheels were about four inches off the ground. We moved to the one next door which wasn't level either, however we had blocks to fill the two inches the front wheels were off the ground. While there are mesquite trees around, most of the CG is a parking lot. The one way signs have been ignored by guests as has the 5 mph speed limit with no enforcement. Site 66 was very sloped. We camped at San Angelo KOA in a Motorhome. Definitely go to the San Angelo Visitor Center. ok KOA. Our particular site 141 was so unlevel that we could not use our jacks and therefor could not use our slides. It rained the night we were there and it was a river down our site. We camped at San Angelo KOA in a Motorhome. The park is well maintained with level gravel sites long enough for our 35ft motorhome and tow. Top to tail parking enabled wide spaces between sites. Picnic table provided at sites but very little shade. Good wifi and cable. Trash is collected at site daily or you can use the bins. The park was quite quiet the 2 nights we stayed. Very little road noise. We would use again if in the area. We camped at San Angelo KOA in a Motorhome. A visit to Fort Concho is a must. We had a lovely meal at Miss Hattie's Bar & Restaurant and then took a tour of Miss Hattie's Bordello. Both tours were extremely interesting, but for very differing reasons, and we highly recommend both. Park is kept very clean and well maintained. Strong wi-fi. Trash picked up at your site. Restrooms-showers were spotlessly clean. All staff very friendly and helpful. Near the lake. Shopping and groceries pretty close. Really nice park. We will be back. We camped at San Angelo KOA in a Motorhome. San Angelo has many attractions. Fort Concho museum, an intact frontier calvary post, is well worth seeing. Shopping on Concho St, Miss Hatties- an old bordello now a museum, and the rodeo in March are all interesting. Fishing on the lakes and rivers and deer hunting in the area is pretty good. Overnight stay. Alternating-direction sites with shared hookups between. All gravel (It's West Texas, after all.) but fairly well maintained. 80 pounds of water pressure, so bring a good regulator. Average Wifi probably because the campground wasn't full. Good AT&T and Verizon cell service. Really friendly staff, professional and competent but laid-back and enjoying themselves. We camped at San Angelo KOA in a Travel Trailer. Boat launch 1/4 mile away. Nice park just south of San Angelo. All utilities worked well, including wifi. Would stay here again. We camped at San Angelo KOA in a Motorhome. Try Henry's Mexican Food while you're visiting. Try Henry's Mexican restaurant for the best chicken fried steak and Mexican food in the area. Short distance to big lake that you'd never expect to find in central Texas. First, visit the exceptional Visitor Center in San Angelo -- you will leave with an armful of maps and brochures. There's LOTS to do in the area! If you happen to be there around Christmas time, don't miss the spectacular light display along the river. Close to I-10 with no road noise. There is a park next door that must be a walking trail for people and pets. We didn't have a chance to explore it but the parking area was always busy so it must be very popular. 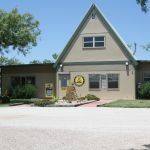 Are you affiliated with San Angelo KOA ?